I'm trying to compile a document that only works with an up-to-date distribution, so I'd like to know: how do I update my distribution? Please provide screenshots where appropriate. If you have a TeXLive distribution (including MacTeX) there are a few things to understand about updating your system. All TeX distributions consist of both binaries (including scripts) and packages (including classes). It is important to understand that for TeX Live these two parts of the distribution are effectively on separate update schedules, and this can lead to some confusion during the period in which the major updates of binaries is taking place. The TeX Live binary part of the distribution undergoes a major update only once a year, while the packages can be updated constantly. This system, however comes at a cost: once a new binary version of TeX Live is available, package updates for the previous years are no longer available. The major binary updates of TeX Live (which come out yearly) must be installed as if you were installing a fresh distribution. Since each version is installed in a folder named by its year, it's possible to have multiple distributions on the same system. which will update all packages that have changed since the last update. with the final option (--reinstall-forcibly-removed) used as occasionally a package will become corrupted in one update and will therefore need to be reinstalled. 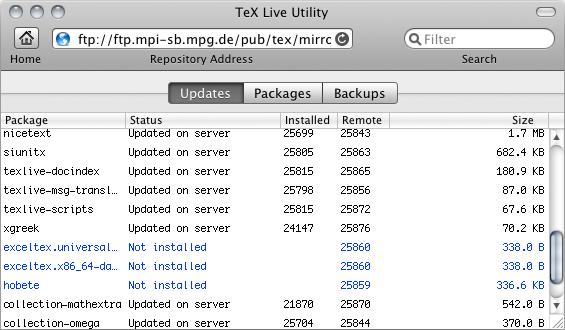 The Mac has a very nice GUI to the package manager called TeX Live Utility. See the MacOS answer for more details on that. When is TeX Live "frozen"? Once a year, the TeX Live packagers must "freeze" the system so that the latest version of the distribution (with new binaries) can be produced and tested. This means that there is a period during which tlmgr will no longer be able to update the current year's distribution even though the new year's distribution is not publicly available. This freezing is necessary so that the new distribution can be guaranteed to work. Once the current year is frozen, it will never be able to be further updated. To keep up-to-date, you will need to install the next year's distribution when it becomes available. For additional information, see Why does TeX Live "require" yearly updates? If you install TeX Live as Administrator/root, then you will also need to update with these privileges. On Windows, an Administrator-privilege Command Prompt is run by finding the Command Prompt icon in the Start Menu, right clicking to obtain the options and choosing 'Run as Administrator ...'. For Mac users, using sudo will be sufficient as tlmgr will be available on the path. This may not be the case in Linux distributions: see below. If you installed your TeX Live system using a Linux package manager (for example, apt-get), then there is no guarantee that it will be updated on the same schedule as the regular TeX Live. In most cases the updates lag by some time, often years, depending on the particular version of Linux you are running. For this reason, most experienced TeX users who run Linux install the vanilla TeX Live distribution directly, bypassing their OS package manager completely. See How to install "vanilla" TeXLive on Debian or Ubuntu? for more information on this. after which you can run tlmgr as a normal user (without sudo). (with sudo if you haven't changed the permissions) and see the steps described in How to remove everything related to TeX Live for fresh install on Ubuntu? for example. With MacTeX on Mac OS X you’ll have the TeX Live Utility installed. If you start this app it will connect with CTAN and list up the possible updates. 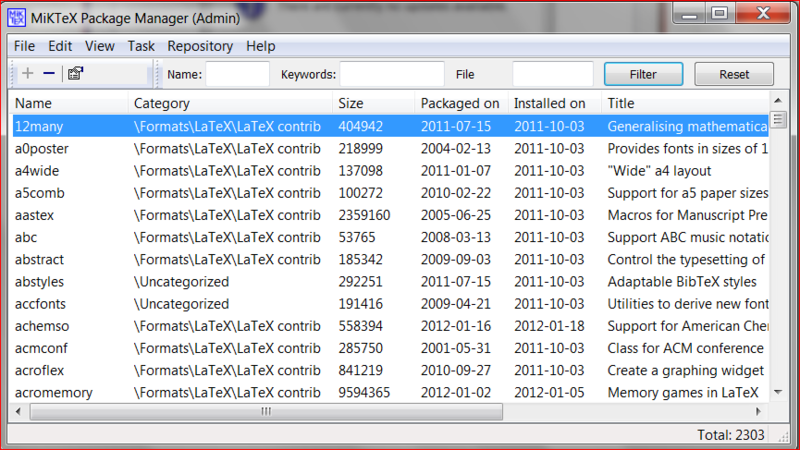 In the list you can see if a package is updated, removed from TeX Live (gray) or new/uninstalled (blue). Now make sure that you are not using one of the packages that will be deleted. If you are using one of them save its files to your local texmf tree. You may also check what's changed in the updated packages, after installing them. Now you can update all packages with cmd + shift + U, or only the selected packages with cmd + U. With cmd + I you can see some information about a package and get a list of documentation files. See also How should one maintain and update a MiKTeX installation? 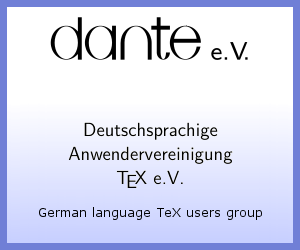 MiKTex can be updated with 2 methods. 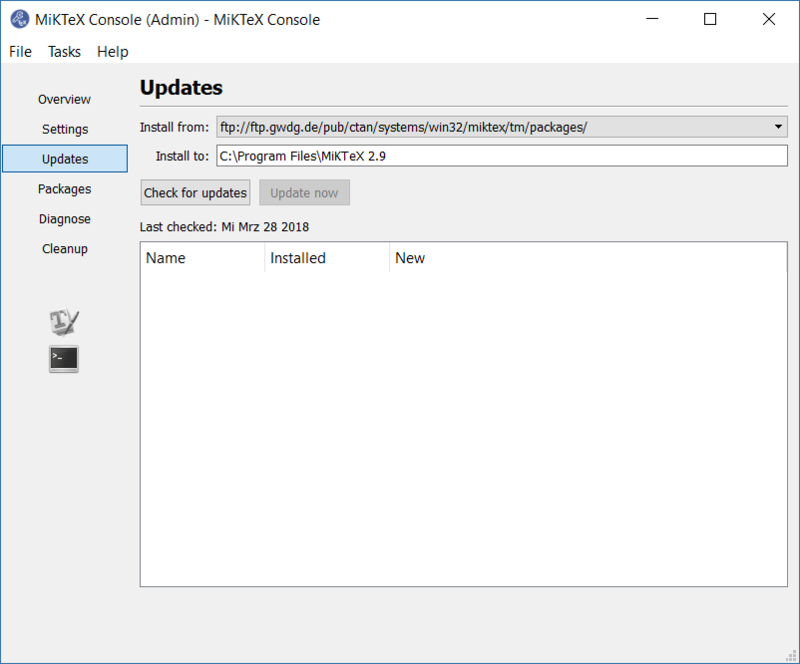 With method 1 only updates are possible – it's intended for this task –, method 2 uses the package manager, originally intended for manual package installations and uninstallations. Unlike in TeXlive also binary files are updated if necessary. They are provided as additional packages with names starting with miktex-<name>-bin (and supporting packages with similar names). 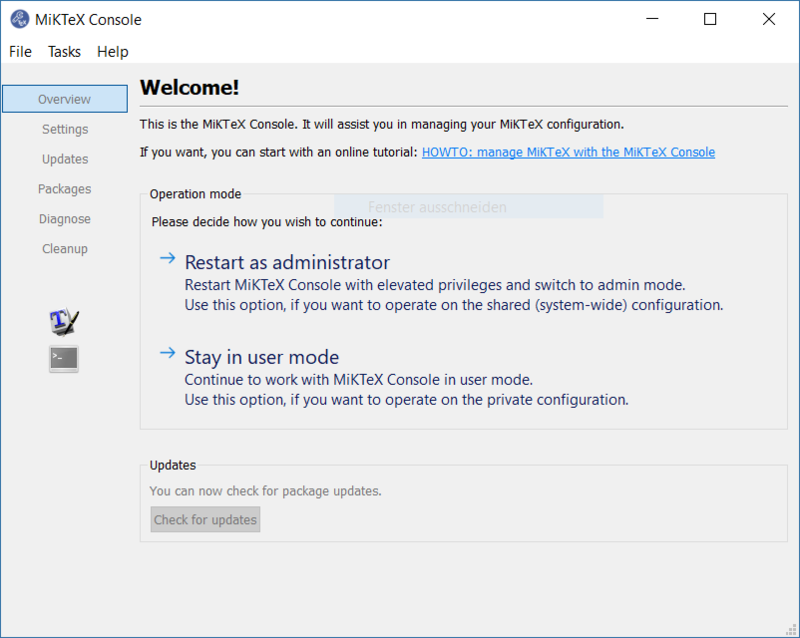 If you installed MiKTeX with Administrator privileges (as a multi-user installation), you will have '(Admin)' versions of the commands described here. To fully update your system, run the update both with and without the '(Admin)' mode enabled. This is necessary as with auto-install enabled, MiKTeX will have managed files both in the system-wide (Admin) area and your own user tree. 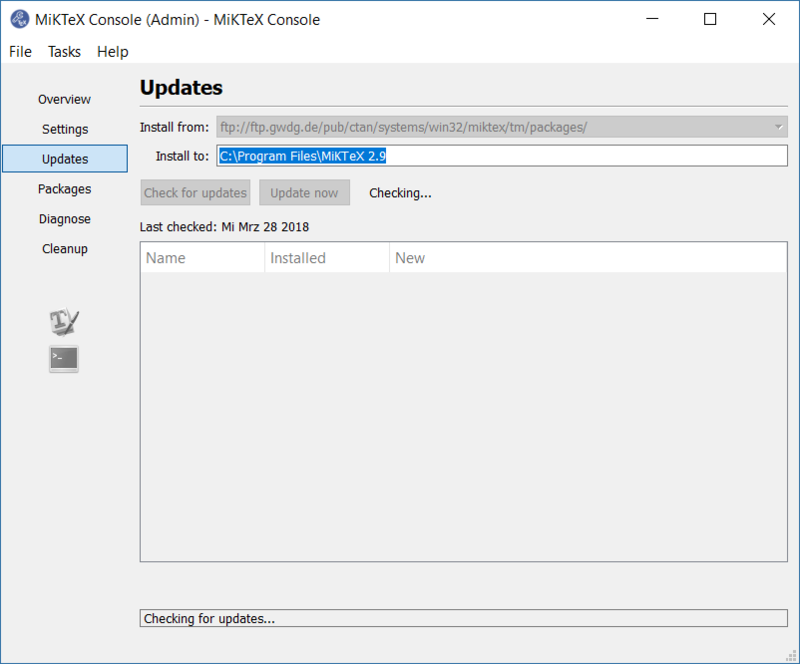 If you installed MiKTeX with Administrator privileges, you will have to go through the following steps once in user mode and once in Admin mode. Go to Updates in the sidebar to the left. 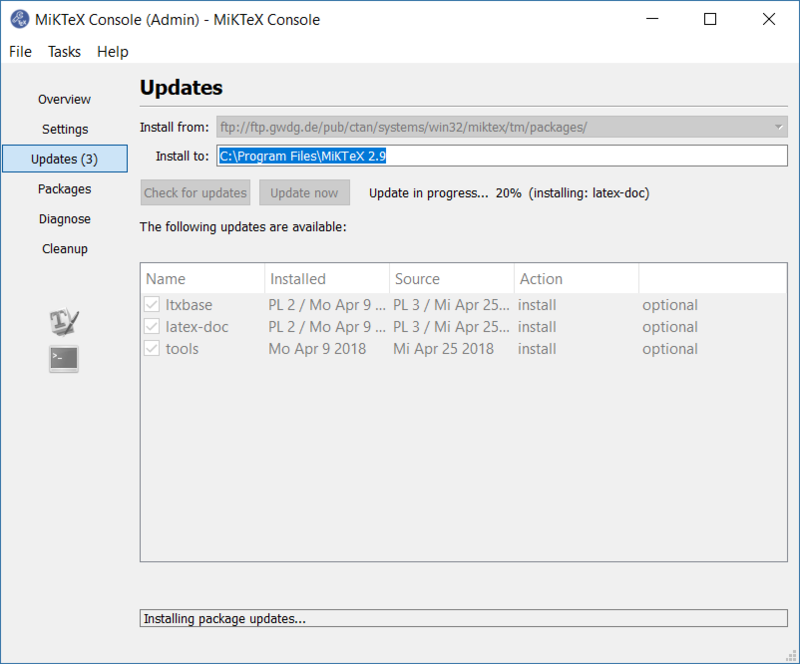 Press on Check for updates and wait for MikTeX to fetch the update information from the package database (this may take a while, hang in there). If updates are available they will be listed below and you can install them by clicking on Update now. You can deselect certain packages. Note that if important system updates are available, not all packages may be checked for updates initially. Do not select more packages in that case, run the updater with only the checked packages first and then re-run it afterwards. On the second run all other packages should be selected and will be updated. The windows is greyed-out while the packages update. It shows a short progress report. You can also search for "Console" or "MikTeX Console" in the search bar. 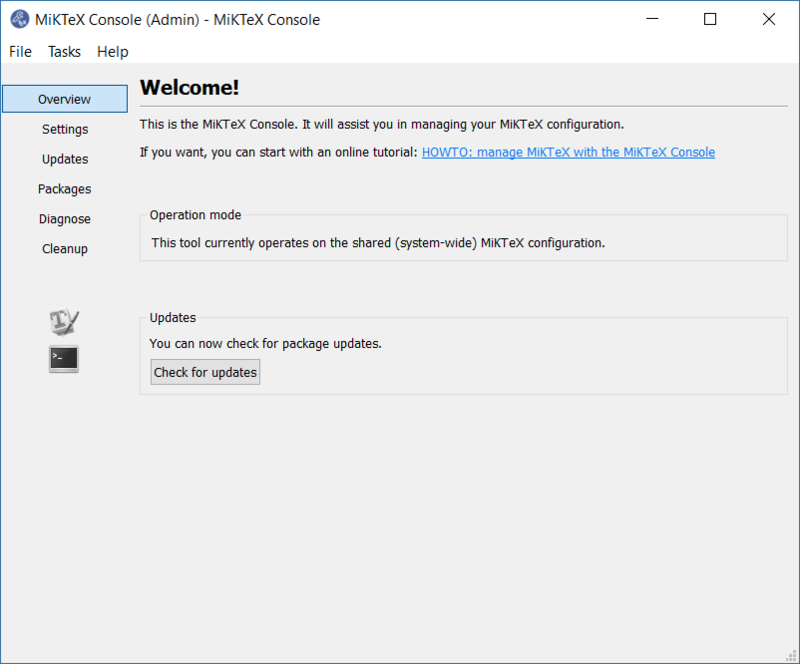 Most MikTeX links in the start menu will lead to the console directly. 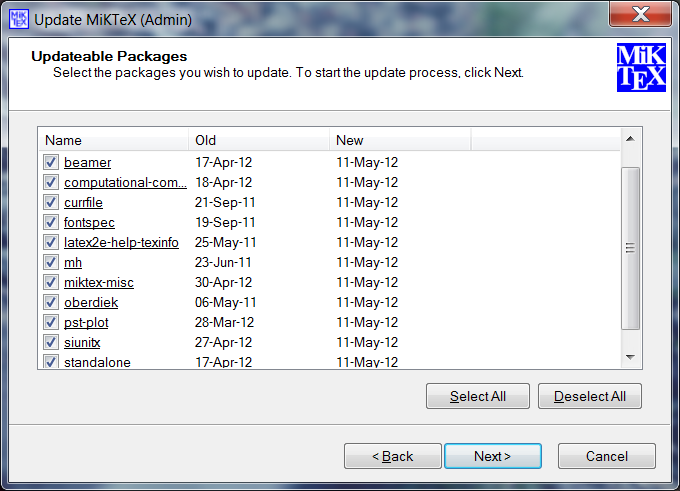 If you have a link "MikTeX Update", it will direct you to the update page of the MikTeX Console. Here, one can choose the package repositories and adjust connection settings. Pressing Next button will take you to the next window which will show, after a search through the repository for update-able packages (if any). Usually all packages are already selected. But sometimes, if an important internal MiKTeX binary has to be updated, this is selected alone and the update should separately be executed, first. Afterwards a second call of the update utility will select all other update-able packages. From here, one can choose the repository tab to change the repository and synchronize the packages with repository. After synchronizing, through Edit tab, we can perform Select All or Select Installable Packages or Select Updateable Packages. When this is done, the + or - buttons under the File menu get activated. By clicking + we can install updateable packages, while - button will remove the packages (Attention!). 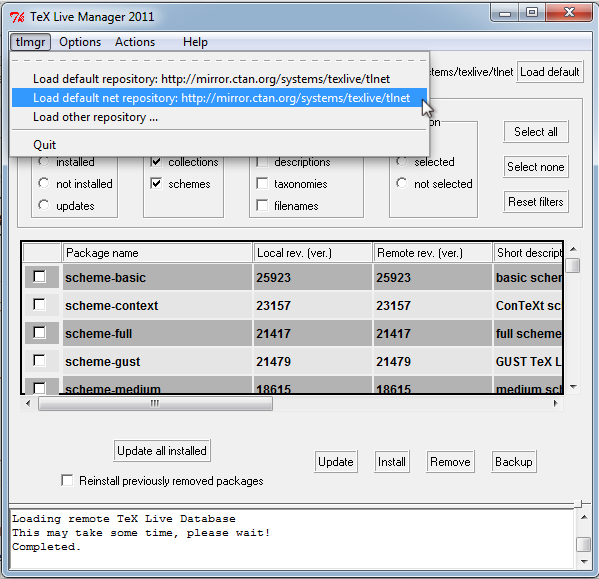 TeX Live on Windows includes a graphical user interface for managing installed packages. The first stage of using this, after starting it from the Start Menu, is to load the package list from the internet. Once this is done, you can simply press the Update button to run the process. Notice that I've chosen to reinstall any removed packages: this is a useful precaution against the occasion issue with a removed package. If you installed TeX Live with Administrator privileges, remember to run the TeX Live Manager with the same privileges. The MiKTeX website has this description for the tool mpm. --MPM is driven by command-line options. --MPM shows a package list view with standard GUI controls (such as tool bar buttons and command menus). In 'windowed mode' the tool starts the GUI interface. Following are the command line options respected by mpm. Test the package repository for updates, then print the list of updateable packages. Install packages listed (line-by-line) in the specified file. Download the list of known package repository URLs from the MiKTeX project server, then print the list. This option is only available on Windows systems: permanently register the location of the default package repository in the user area of the Windows Registry. The location can be either a fully qualified path name (a local package repository) or an URL (a remote package repository). Enable trace messages. The tracestreams argument, if speciefied, is a comma-separated list of trace stream names (Chapter 9, Trace Streams). Update the specified package, if an updated version is available in the package repository. Update all installed packages, if package is omitted. Update packages listed (line-by-line) in the specified file. Verify the integrity of the specified package. 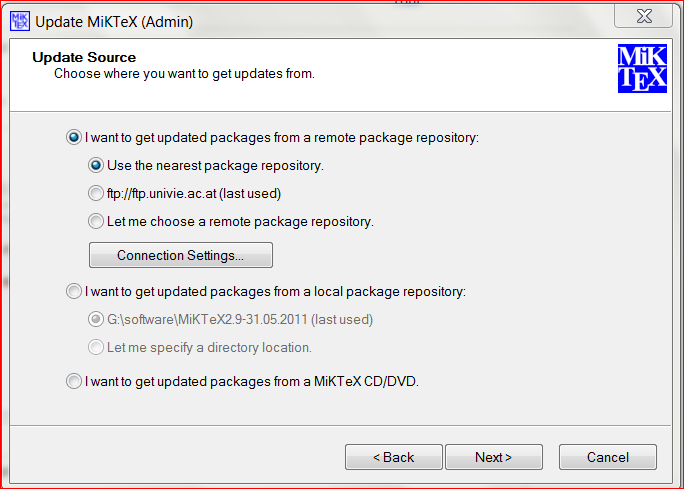 All files are installed in the TEXMF installation directory (usually C:\Program Files\MiKTeX 2.9). 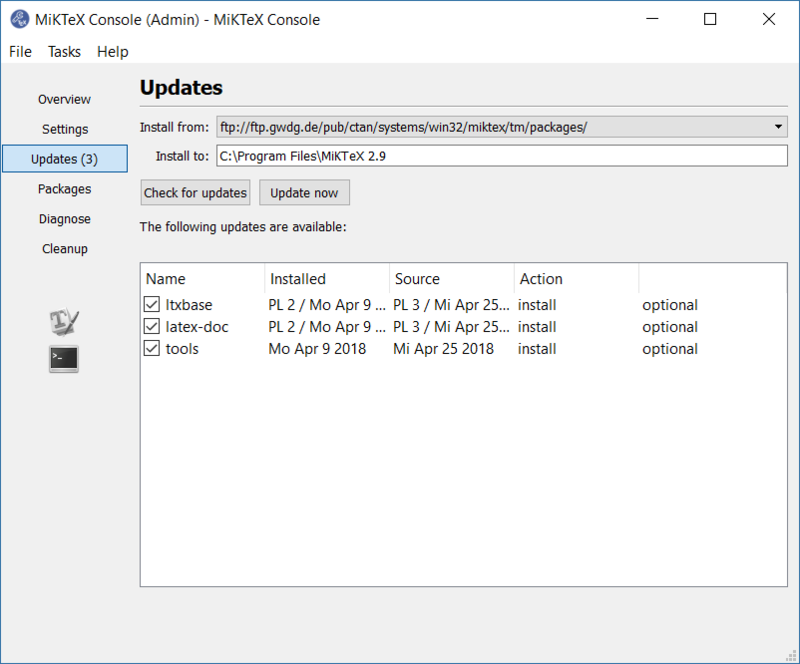 It may be necessary to specify the location of the installation directory, if you are running MPM as a standalone program, i.e., if MiKTeX is not the TeX system. The --install-root option allows you to set the installation directory for one invocation of MPM. 2.. Boot from the install kernel by boot media or bsd.rd and follow the upgrade steps, which are very similar to the install process. A typical OpenBSD installation takes less than 10 minutes. That is it. You now have completely updated system with all packages updated not just TeXLive. The above is just an outline of the upgrading process for a typical desktop machine and may vary pending on your local modifications. It is not meant to be substitute for reading official documentation. Upgrading is a convenient way to bring your OpenBSD system up to the most recent version. However, the results are not intended to precisely match the results of a wipe-and-reload installation. Old library files in particular are not removed in the upgrade process, as they may be required by older applications that may or may not be upgraded at this time. If you REALLY wish to get rid of all these old files, you are probably better off reinstalling from scratch. A typical OpenBSD installation with custom siteXX.tgz and install/upgrade.site files/scripts will take lass than 10 minutes plus another 10-15 minutes for installing all packages as long as they are stored somewhere locally. Not the answer you're looking for? Browse other questions tagged distributions updating or ask your own question. How to install titlesec and secsty packages? How to change LaTeX package default download website? How to update TeX Live distribution manually (without using the frozen TeX Live Manager)?